in the Upper Peninsula, breeding Siberian Huskies, Alaskan Malamutes and Border Collies. He also did competitive herding with his Border Collies. He was a coin collector and had just completed a coin collection for his granddaughter. He loved gardening and restoring his MGB cars. In addition to his wife of 43 years, he is survived by son Ian (Melissa), granddaughter Alexis, brother Glenn (Laurie), sister Janice (John) Lapenta, brothers-in-law Robert Happ, Timothy (Susan) Happ, sister-in-law Susan (Robert) Mason and many nieces and nephews. one great-grandchild; and her brother, Brian McDowell. Also many extended family members, dear friends and colleagues. Burial Great Lakes National Cemetery. Larry Rutka age 78, passed away peacefully in his Highland home on Saturday, August 29, 2015 after a year long battle with cancer. Larry was born in Detroit, Michigan on March 5th, 1937 to Walter and Christina Rutka. At the age of seventeen, Larry enlisted with the United States Navy and was stationed in Pensacola, Florida. Upon his return to Michigan in 1957, he met Joesphine Landoski on a blind date. After a brief courtship, the young couple married on September 2, 1961 and together raided their two sons in their Highland home built byu Larry and his father.Larry worked for 33 years with the United States Post Office and in his spare time enjoyed casinos, fishing, camping and collecting coins. Daniel Claude Cramer of Highland, passed away May 5, 2016 at 86 years of age. Husband of Leona. Father of William (Pamela) Nichols, Gay Cramer, Daniel (Dawn) Cramer, Jr. and the late Richard Oliver Nichols and his wife Rebecca. Grandfather of nine grandchildren and several great grandchildren. Also survived by many nieces, nephews and extended family and friends. Preceded in death by his first wife, Hilda "Betty" Cramer. Dan was a founding member of the Huron Valley Numismatic Society. He enjoyed hunting and fishing as well as traveling. He will be greatly missed by everyone that knew him. Fred Beksa Huron Valley Numismatic Society Charter Member Fred Beksa, of Flat Rock, Michigan passed away at age 68 on August 25, 2016. He was an avid collector as well as coin and paper money dealer. Sherry Ann Staricha, a resident of Highland Township, died at her home on October 13, 2016 after battling cancer. Born on February 14, 1941 in Milford, MI, Sherry grew up in Milford and graduated from Milford High School. Following high school she earned a Bachelor’s Degree from the University of Michigan. Sherry lived… in the Milford/Highland area her entire life. Sherry worked in the human resources department for the General Motors (GM) Proving Ground and the GM Tech Center for over thirty-three years. In “retirement” she worked as a hygiene coordinator at a dental practice in Brighton, Michigan for 16 years. Sherry was very organized, with an attention for detail in all her affairs. She was known to all as a "class act", always wearing beautiful clothing accessories and jewelry. In addition to being an active member of the Huron Valley Numismatic Society (HVNS), Sherry enjoyed golfing, quilting, knitting and sewing and was always present at her daughters and grandchildren’s sporting and special events. She was a devoted and active member of the Milford Presbyterian Church where she sang in the choir and started the Prayer Quilt group. Sherry is survived by her husband John, who also an HVNS member, she is survived by daughters, step-children, grandchildren and great grandchildren. Guenter Otto Andreas Loepertz, a longtime Highland resident, died peacefully in his home on October 31, 2016. Guenter, eldest son of Otto and Hedwig Loepertz was born on May 21, 1938, in Hanover, Germany. His family immigrated to the United States in October 1951, settling in Rochester, New York. Guenter met his wife, Anita (nee. Hanlon), at a school dance and they married on February 1, 1958. Together they raised four daughters. He earned an associate’s degree in Applied Science and… Mechanical Engineering from Rochester Institute of Technology and began an apprenticeship at Delco Manufacturing Plant. They moved to Farmington, Michigan in 1965. In 1971, Guenter founded Mutual Tool & Design Co in Highland. He prided himself on high standards and craftsmanship for more than 45 years. He embraced a life-long love of learning and community service. From founding his own business and providing apprenticeships, to coaching, leading scouts and planning countless community events and themed dinner parties, Guenter was constantly sharing his time and talents. He served as chairman of the Highland Senior Center, was president of the Livingston County Genealogical Society, and a charter member of Huron Valley Numismatic Society (coin club). He was actively involved with the Boy Scouts of America for more than 45 years. He was inducted into the Michigan State Youth Soccer Association Youth Hall of Fame in 1992. Guenter traced his family lineage back to the 1500s and spoke at many genealogical societies and libraries. However, his interest in family was not focused on the past. Guenter lived each day to the fullest, sharing his love of travel, cooking (including German potato salad and beef rouladen), wine tasting, World Cup soccer and more. He was an upstanding citizen, embracing the American dream and providing a stable and loving home for his family. He will be remembered for his reserved demeanor, his gentle guidance, his warm laughter – and his affection for whipped cream on holiday desserts. He will be missed by all with whom he was associated. He is survived by his beloved wife of 58 years, Anita (nee. Hanlon); daughters, Diane Loepertz, Theresa (Bill) Wiles, Christie (Charles) Hix, Andrea (Chuck) Knipe; grandchildren, Jeremy, Sabrina, Jonathan, Joshua, Nathanial, Amanda, Alyssa, Katelyn and Jacob; twelve great grandchildren and many extended family members and dear friends. He was preceded in death by his parents, Otto and Hedwig Loepertz; brother, Dieter Loepertz and grandson, Michael. Francis "Frank" Proulx passed away on December 10, 2017 at age 67 after a tough battle with with cancer. He leaves behind his wife of 44 years, Cheryl, and adult children. 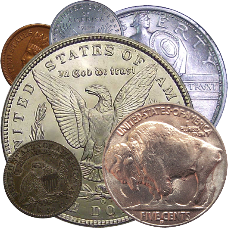 Frank was an avid collector - especially of silver dollars, and was an active member of HVNS for four years. Clarence R. "Joe" Stiger, an early member of HVNS, passed away on September 8, 2017 at the age of 89. Joe was a World War II veteran, and, in addition to collecting coins, enjoyed fishing with his sons and friends." Joe was a member of HVNS during the 2010-2011 years.